Yesterday, Carlsberg unveiled their latest TV ad with an Irish market exclusive. The ad, called 'Spartacus', follows Carlsberg's 'That Calls for a Carlsberg' creative / brand route and sees a modern interpretation of the 1960's film of the same name. Set in an ultra-modern skyscraper office with hundreds of people working in an extremely regimented and drone-like environment, the ad is the story of one workers mini rebellion and the revolt that then ensues. The film starts when the overbearing company boss enters the room in a fit of rage. He shows a YouTube video depicting him as a dancing monkey, created by the user, Spartacus. He demands to find the culprit of the prank. Reluctantly, the hero ‘Spartacus’ stands up and identifies himself with a bold 'I am Spartacus'. In quick succession his fellow colleagues decide to support their friend and join him one by one claiming to be Spartacus as well. Within in seconds the entire room is standing up in force to take the heat. 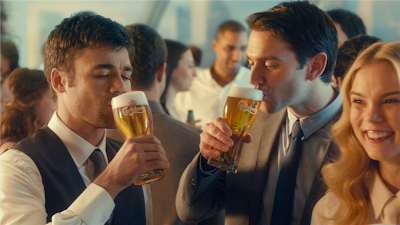 ‘Spartacus’ ends with the team of workmates heading to the bar for a well-deserved pint of Carlsberg – underlining the brand’s positioning, That calls for a Carlsberg. The ad was created by London-based creative agency Fold7, in partnership with Carlsberg's International Brand Marketing Team. The ad will be rolled out across Carlsberg's global markets, starting in Ireland. It will be aired across traditional media and digital channels and will be complemented by a suite of activations, based on the same theme of standing up for your mates, The ad will be supported by substantial media spend in the Irish market.